Our mission is to provide comprehensive physical and occupational therapy and wellness opportunities to the diverse community that we serve. This requires an awareness of the individual rehabilitation and fitness needs of the residents, workers, and employers within our community, as well as a commitment to working closely with physicians, as needed, to assure optimum results. Our treatment approach emphasizes functional restoration utilizing manual therapy techniques, modalities, movement education and effective therapeutic exercise prescriptions. 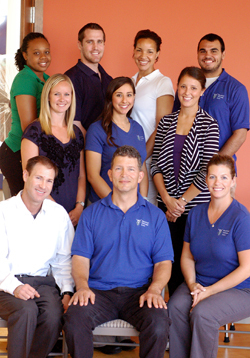 Our wellness and fitness services are designed to meet an individual's personal needs and goals. Our 6,000 sq. foot facility contains a full line of exercise equipment, treadmills, recumbent bikes, and elliptical machines. The Nintendo Wii Fit System is a recent addition to our line of fitness equipment. Curtain dividers between treatment tables allow patient privacy as needed during treatment sessions. Our facility also includes a spacious Pilates studio with four Pilates Clinical Reformers, a Cadillac, a Wunda Chair and a Ladder Barrel.